Chandigarh, Nov 22: Rejecting suggestions of supporting a ban on the movie 'Padmavati', Punjab Chief Minister Amarinder Singh on Tuesday decried attempts by some vested interests to misinterpret his statement on the issue. The Chief Minister said that he had neither supported a ban on the movie nor backed those issuing threats to the actors and crew of Padmavati. He called for restraint amid the volatility prevailing on the issue. A distinction needs to be drawn between threats and protests, he added. 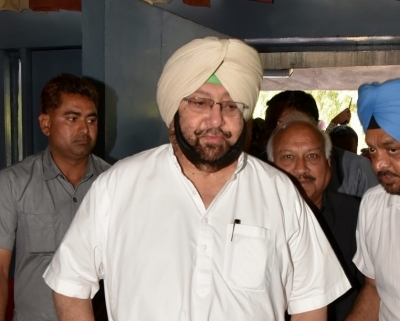 "How can I seek or support a ban on the movie when I have not even watched it," asked Amarinder, refuting the unfounded conclusions that had been drawn from his statement made on Monday in which he had said if there had been any attempt to distort history, then protests against the same were justified. "Nobody can be denied the right to disagree with others and protest peacefully in a civilised and democratic system, but nobody (neither an individual nor an organisation) has the right to threatens someone with whom he/she does not agree on any issue," said the Chief Minister. "I totally condemn all people who are issuing threats and expect the law to take its course against them," he said, adding that any attempt to vitiate the country's peace and disturb its harmony needs to be dealt with effectively.